The project explores Diversity in Culture in India through different cuisines from North to South, East to West that meet in the heart of the country in it's capital. We tried Kashmiri, Rajasthani, Malabari-Konkani and Bihari cuisines in Delhi to understand food history, ingredients and interpretation in a cultural context. *this project is purely designed for the love of food, culture and community and is away from any commercial promotions and monetary gains. No animals were harmed in this project. 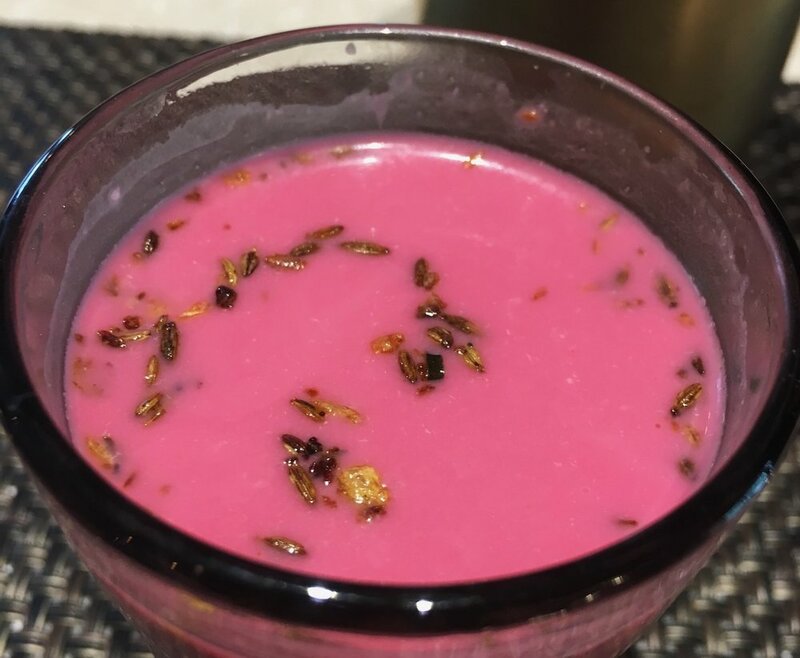 Nadur Yakhni (translates into Lotus Stem in Yogurt) is a popular vegeterian dish in Kashmir. Fennel and Ginger Powder with ghee make a spicy gravy for these lotus stems that is perfect with the crisp and flaky seeded (sesame and poppy seeds) buttery bread. There are various options when it comes to breads of Kashmir, with sheermal ( is sweet and goes well with mutton gravy), and lavas (in the picture) being the most common. Roath is a sweet bread made on special occasions like arrival of a new bride, this has coconut, cashews and almonds( in the picture) . In delhi, Matamal offers authentic Kashmiri food and for those who are looking for a fine dining experience could visit Chor Bazaar in Bikaner House. Even though mutton and rice are the most common foods in the region, we wanted to try the vegetarian offerings and were surprised to see the variety that included dum aloo, Chaman( fried paneer), spicy baigan and more. The tradition of Wazwan fascinates me the most, which is a multi-course meal and in the Kashmiri Muslim tradition, it is treated with great respect. Its preparation is considered an art as the traditional number of courses for the wazwan is thirty-six. Another interesting ritual is the Noon Chai or Sheer Chai which is a common breakfast tea in Kashmiri households and is taken with breads like baqerkhani. Often, this tea is served in large vessels called samovars. For special occasions Kahwah which is green tea with saffron, spices and nuts is served. Every household has its own recipe for Kahwah and can also add milk and sugar to it. Litti Choka from Bihar is a staple food of the region. These are made with Sattu ( gram flour) and the deep fried for it to last longer and could be consumed as snacks on long journeys. In Early times, the state was primarily an agricultural state and farmers could pack their littis which are rich in protein for their long hours of work. This goes well with chokha, a spicy mix of brinjal and potato mash served with daal. Together this forms a wholesome meal made with local ingredients. In Delhi potbelly cafe offers the most authentic Bihari dishes. Bihari cuisine consists of bhojpuri and Magahi cuisine which are mainly vegetarian due to its Hindu and Buddhist influences. However in Mithila regions, meat is used. Use of ghee and buttermilk is extensive in this region because of hot weathers most of the year. Thali is a platter with a variety of dishes from a region that is typical to Indian Tradition. Malabari ( Kerala) and Konkani ( South of Maharashtra and Goa) thali consists of Sol Kadi( a welcome drink made of Kokum and Coconut milk), Corn Kosambri salad, paneer ghee roast, baby corn butter pepper garlic, sambhar, rasam, drunkstick pullimunchi, ullitheeyal, mushroom sukka, coconut rice, raita, leaner payasam. One can see the extensive use of spices like Chillies, curry leaves, coconut, mustard seeds, turmeric, tamarin with coconut and rice being a base for most dishes. Use of Fish in Konkani and Beef in Malabari is common with its christian and islamic influences. In Delhi, I recommend Sanadige for authentic Malabari and Konkani cuisine. The Thar has history of warship and princely affairs thus making the food rich yet practical as it needed to be stored for many days in the early days. The state has the highest number of vegetarians and variety of snacks again due to the history of wars in the region and also it being the west most frontier of the country, it invited many traders and travellers bringing in new ingredients like spices! The region sees very less rainfall thus the core of the food is grains and spices and very less greens. The Thali offers a variety of spicy foods but also coolants to go with it for its hot weather. The thali consists of Aam ras, Bhalla chaat, sweet dal, spicy daal, gatte ki sabzi, ker sangri, dhokla, pakora, garlic chutney, daal baat churma, puran poll, fulka and bajra roti. In Delhi I recommend Kathputli for an authentic experience.